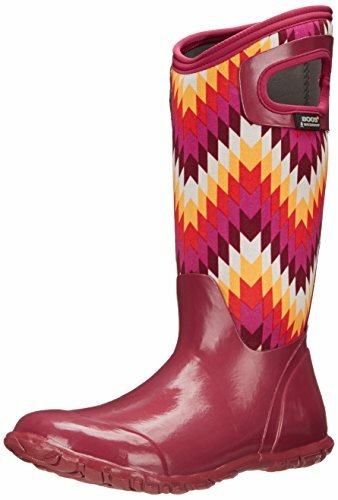 Comfortable, durable, and stylish are a few words that describe the women's Bogs North Hampton Native rain boot. This waterproof rain boot is comfort rated from temperate to 5°F/-15°C, 5mm Bogs Neo-TechTM Lite insulation construction and streamlined upper design for long-lasting use. It comes with pull-on rubber handles for easy on/off. With Bogs Max-WickTM lining, it absorbs and eliminates sweat away from the foot to lend maximal comfort. Under foot, there is a molded EVA insole with DuraFresh bio-technology that decreases the growth of odor-causing bacteria. The women's Bogs North Hampton Native rain boot lends exceptional warmth and practicality. New Bogs Women’s North Hampton Waterproof Boot available in such a convenient webstore is a true catch! Won’t even compare Bogs Women’s North Hampton Waterproof Boot with what is sold in other stores. This one is the best!